Nuts are a delicacy, a favorite of many adults and children. However, introducing them to the child's diet, it is worth considering how to bring a baby greatest benefits and to avoid negative consequences. On the one hand, nuts are extremely useful for the child's body. They are the source of protein, which nutritional value is close to animal protein. Especially protein-rich peanuts. Nuts contain unsaturated fatty acids, essential to your child's body for normal development and growth. The greatest number of fats found in hazelnuts, walnuts, almonds and peanuts. Of particular importance are the polyunsaturated fatty acids omega-3 that are uncommon, but are present in walnuts. 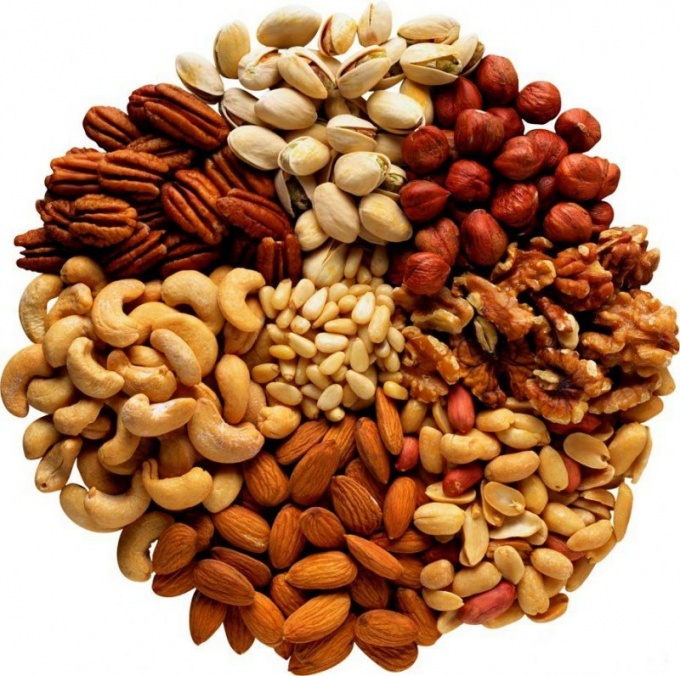 And finally, nuts are rich in vitamin E, potassium, magnesium, iodine, iron, and cobalt. The highest amount of vitamin E and minerals contains in hazelnuts, and a little bit less walnuts and pine nuts. As with any product, nuts, in addition to benefit, may cause harm, so it should be possible to weigh all possible consequences before giving their child. Pediatricians around the world agree that up to three years your child nuts is absolutely contraindicated. First, any nuts – trudnosgoraemyh product, and the immature digestive system of the baby just can't take it, hence the abdominal pain, bloating, diarrhea and other effects. Secondly, nuts are very allergenic, and children exposed to the risk of allergies is much stronger than adults. And if in adults this disease is manifested mainly rash, runny nose and sneezing in children, the consequences can be more serious, up to suffocation. Thirdly, nuts are high in calories treat, 100 g of this product contains 500-600 Calories, so kids are prone to obesity, you need to give them with care. In addition, nuts are prone to formation of mould. Also they often attract insects, so it is better to buy them in their original form, and cleaned independently. Before giving nuts to a child, they should be thoroughly washed and dried. Often poor quality is peanuts. And finally, a small child may just choke on a nut. Thus, healthy children, not suffering from allergies and not obese, according to the age of three in the diet include nuts, for a change of taste and to enhance nutritional value diet. You should start with one nut a day and closely monitor the body's reaction to a new product. Later, if you are convinced that the child has a normal stool, he feels good and he's not complaining about a stomach ache from eating nuts, you can give 30-40 g of nuts a couple of times a week.